This is a public service announcemnet for you guys! Don’t try to cheat a witch especially when she’s your girlfriend too. When I found out that my girlfriend was pregnant I decided to dump her. I told her I was not ready to be a father and that she was her fault because she didn’t take the pill, She answered back that respected the decision of not being the father but that I would be a good aunt. warn the other boys in the same conditions. 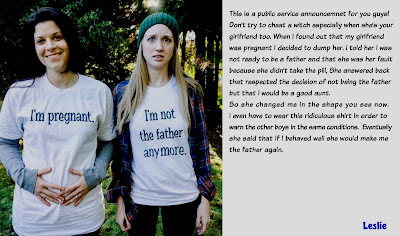 Eventually she said that if I behaved well she would make me the father again. Better hope it's before she thinks your make a great mother.